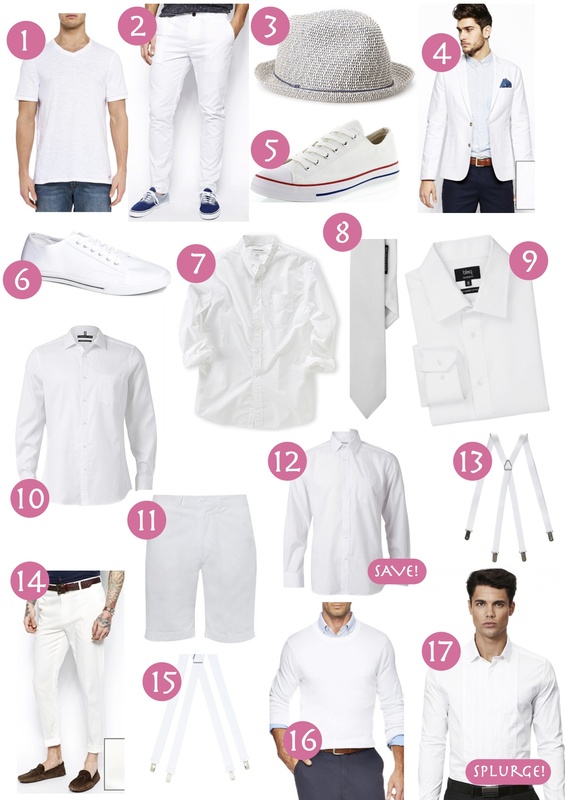 Brisbane’s third annual Diner en Blanc is now less than three weeks away and after releasing my shopping guide for women last week, the organisers asked me to uncover some great white buys for the guys. With a weekend full of plans, I decided to let my fingers do the walking and found some great pieces online, ranging in price from $10 to $170 (with most under $50). You can easily put a four piece outfit together (pants, shoes, braces and shirt) for under $100 … and with summer just around the corner, you can’t go wrong with a pair of white chinos in the cupboard, fellas! | 4. Asos Slim Fit Blazer in Washed Cotton, $105 | 5. Target Harry Canvas Shoes, $12 | 6. New Look Plimsolls, $16 (available from Asos) | 7. Country Road Vintage Poplin Shirt, $90 | 8. Target White Tie, $16 | 9. Blaq William Tailored Business Shirt, $50 (available at Myer) | 10. Target Limited Editions Shirt, $32 | 11. French Connection Harry Short, $30 (available at Myer) | 12. Target Men’s Essentials Classic Fit Shirt, $10 | 13. Target Men’s Braces, $12 | 14. Asos Skinny Fit Smart Pants in Cotton Sateen, $48 | 15. Buckle 25mm White Braces, $30 (available at Myer) | 17. Nautica Sweater, $80 (available at Myer) | Politix Torquil Shirt, $170 (available at The Iconic). I got dumped. By text. Humm, can’t say I’m sold on white for guys! It might look ok on a handsome italian hunk or George Cloony, but for real guys who mess around with motorbikes and generally rough it, it would be a disaster! Plus, if you’re not stick thin, I reckon a guy could look like a snowball! Thanks for the tips. I have more clothes & shoes than most. But have the worst time dressing in White. I’m going back for a second year and not sure what to do. would so like to wear my favs-black, grey and dark blue. If i go again next year I’m not messing around, gonna buy a nice expensive suit early on in the game before they’re all sold out. Thanks again. Are you going this year? Ours is Sat June 20 in HI.